Discover easy to deploy growth opportunities with a measurable impact. 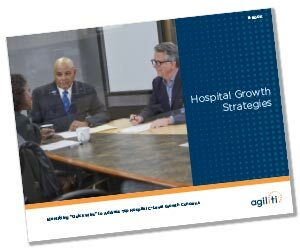 Hospital CEOs have had to rethink what growth means and how to achieve it. Many understand that new strategies are needed to thrive in the value-based era, but few are aware of which ones will deliver both “quick wins” and sustainable, long-term growth. Complete the form to receive this free E-Book. © 2018 Agiliti Health, Inc.